Spy kids must be able to secretly exchange messages... An easy way to create secret codes for kids is this build-your-own cipher wheel. One of the main tasks of spies is to exchange messages, while at the same time keeping the contents a secret from anyone who may intercept it. The activity of making a message unreadable for others is called "encrypting". If you want to make the message readable once again, you have to do "decrypting" the message. For both "encrypting" and "decrypting" you use the same code. This code is called a "cipher". On this page, you find the instructions for making a tool that helps you create your own secret code for kids! 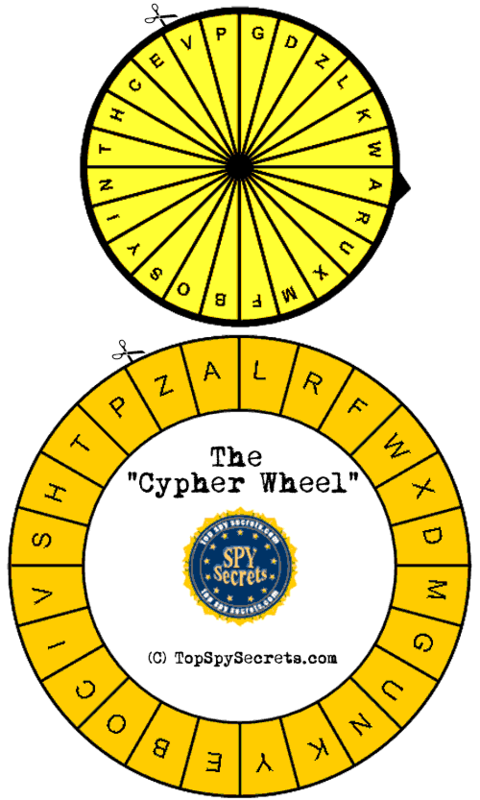 This tool is called the "Cipher Wheel", and it will help you do the ceasar cipher. Print the two wheels you find below, on thick paper (or paste it on thin carton). Cut out both wheels. Make sure you don't cut off the black triangle on the smaller one! With a sharp point, make a small hole in the middle of both wheels. Join the two wheels together (small one on top of the big one) with a split pin or cotter pin. 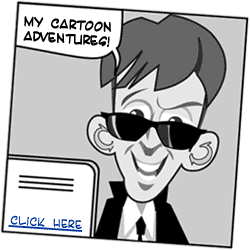 You're ready to create your own secret codes for kids! First, write down your message. Only use letters from the alfabet. No numbers (write them out), and no punctuations. The cipher wheel contains only 24 characters. For a "J" put in a "Y", and for a "Q" put in an "O". Select a single character from the alfabet (except "J" and "Q") and write down that character as the first letter of your encrypted message. H (for this example, I've chosen "H"). Rotate the upper wheel until the black triangle points to the character you have just selected. This character is called the "Key", you'll need both the cipher and the key to be able to decrypt the message. IMPORTANT: Make sure the triangle keeps pointing to the key character during the encryption of the message! Now, for each letter of your message, find that character on the outer wheel, and write down the letter that is exactly beneeth it on the inner wheel. When finished, you'll have your encrypted message! Don't forget to destroy the original message! Look at the first character of the secret message. This is your key. Rotate the upper wheel of your cipher until the black triangle points to that character. Scratch that first character, as it's not part of the message. IMPORTANT: Make sure the triangle keeps pointing to the key character during the decryption of the message! for each letter of your message, find that character on the inner wheel, and write down the letter that is exactly above it on the outer wheel. Check the Y's and O's, if the message makes more sense with a J or a Q instead. Don't forget to destroy the message after you've read it! Have fun creating your own secret codes for kids! And remember: TOP SECRET!